Come train with us in the mountains of Colorado! Our off-road camps are perfect training for Lory, Beaver Creek and Aspen Valley Xterra Triathlons. 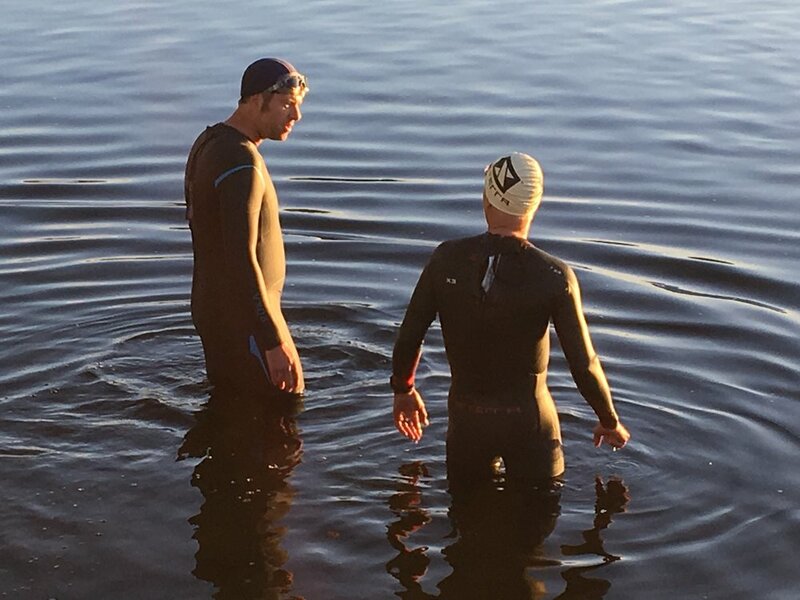 Practice your open water swimming, mountain biking, and trail running skills at 8700' of elevation with two experienced triathletes, Coach Kurt and Coach Cindy. We swim in the crystal clear waters of North Pond in Silverthorne, where the summer water temps are in the mid- to upper-60's. We work on swim technique and anxiety-reducing skills. We swim around bouys and practice T1 transition skills straight from the water. We are also known to have a stand up paddle board nearby for those training for a triathlon with a SUP-division (like Aspen Valley Xterra) or someone wanting a break from OWS training! Mountain-biking in Summit County is oh-so-fun! Miles of single-track with spectacular mountain views await you. We start with an easy 10-mile trail near Keystone that provides ample opportunities to practice technical skills. We will stop at difficult steep rocky sections and practice going up and down before moving on to wide open meadows with rolling hills where we can go faster. We will review nutrition, hydration, and practice off-the-bike T2 transition skills as well. Well, the run. What can we say - the trails are endless. We run on trails that provide both flat and climbing sections. We run up and down and all around. Because our camps are in the summer, the wildflowers are often in full bloom making it a motivating place to run and train. We will discuss trail-running skills and pacing strategies. We review nutrition and injury prevention, as well as on-the-spot first aid that might be necessary in an Xterra event! Put me on the list for 2019! Photos from our 2018 High Altitude Xterra Camp are here.